If aren't familiar with Alberta, you might not know how dry and cold it gets in the Winter. It is brutal, especially because my husband, my son and I all have reactive, sensitive skin. Our son suffered from eczema on his cheeks for a good chunk of his first year of life and it was a constant struggle to keep it under control. 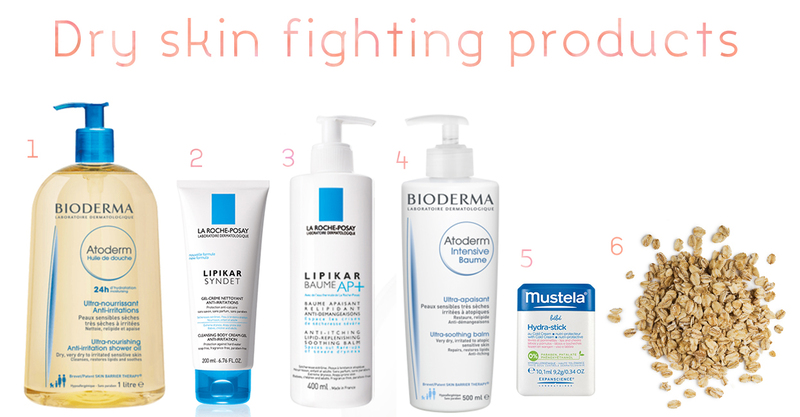 I have since then found tips, products and treatments that work and help us keep eczema and dry skin at bay during the colder months. Here is how we do it. - 1 - I recently discovered this shower oil and the whole family now uses it. It is scented, but it has not been an issue for us. - 2 - This is a great scent-free option for particularly sensitive skin - I use it on my son when his skin feels drier. - 3 - and -4- Both these body moisturizers have saved us from itchy skin, dry patches and discomfort. They are both unscented, creamy and soothing. - 5 - This little stick is great for our son's cheeks. Applying moisturizer on a baby's face is no easy task if they have other ideas. With this easy to twist up stick, we can moisturize and protect his skin as needed and even on the go. - 6 - I mentioned oats above. They work and cost almost nothing! Try it, you'll be surprised at how milky and soothing they make your bath.